You can define minimum and maximum values for each parameter. Each randomization is undoable, but you better backup before use. -minor update, now you can choose the coordinate system (local or world) for position and rotation randomizers. -Selection Randomizer switched to the percentage instead of every N method. Which makes it more accurate. -Minor Bug Fixed regarding to the redrawing issue while randomizing selected vertices. -Added wirecolor randomization and material randomization. Wirecolor randomization assigns random wire colors to selected objects with the option of removing material of the objects. Currently selection randomizer doesnt support edit_mesh modifier.There are no problems with editable_poly, editable_mesh, and edit_polymodifiers. When randomizing vertices of an editable poly object, it may notredraw the randomized selection on the viewport. Scrubbing thetimeslider or changing the viewport is a temporary solution. There isno such thing with edge and face selections and other than editablepoly objects. -support for subobject support for selection randomizer added. Now itrandomizes your selection depending on selection type. If edges arechosen, it randomizes edges. If objects, it randomizes objects etc. -added Material ID randomization - Thanks Daniele Debernardi for the idea ! -Single button for all length, width, height and scale parameters. -Radius1 and Radius2 compatible for tube and torus primitives. -General Naming and tooltip fixes. Submitted by Custom on Fri, 2014-10-17 05:33. Submitted by Picklock on Thu, 2013-06-13 10:02. From what I can tell, I can select some polys and run the script, but it just randomizes all the poly's i've selected the same way? I was under the impression I could select a bunch of polys and they would all be randomized differently from each other? Also, the Map Channel option doesn't seem to do anything. After I run the script, I have to manually input the map channel into the UVW Xform modifier that was generated in order for it to affect the proper channel. 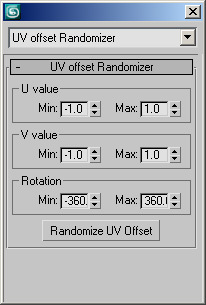 Submitted by themaxxer on Thu, 2012-04-26 01:16.
is possible to get an option to rotate the uv offset only in 90°? this would be very handy. Submitted by Jordan Walsh on Thu, 2010-11-25 16:07. Submitted by W DIGITAL on Thu, 2010-11-25 04:43.
nice ill chek it out! Submitted by Pewi on Thu, 2010-11-25 00:40. It can randomize just about anygthing in a scene. Submitted by W DIGITAL on Tue, 2010-11-23 07:08.
how can i randomize colors in diffuse channel? if i have 100objects with same vray material, but want each to be different color? Submitted by Anubis on Tue, 2009-07-28 12:06. Hi Arda, I guess you were glad to report an bug. if so, review the source code of my script. Submitted by yhcnils on Thu, 2009-07-09 08:43. Excellent script! I use it all the time. I was wondering. with random rotation is it possible to add an extra box for angle steps. For instance if you want to rotate objects randomly but with steps of 90deg. or 45deg or other angles. Submitted by masquerade on Thu, 2009-07-09 04:01.
it doesnt work on element mode. Just face, edge end vertex mode you can randomize selections. Though, it definitely should work with element mode too. I will take care of that when I have some time.